What are you doing while you’re waiting? 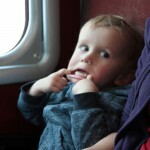 I have tried a number of times to write a post but I just end up complaining about South Auckland and making myself homesick for Switzerland. So I have decided only to post stuff that doesn’t involve complaining. Daniel and I just watched the movie “Fireproof”. It is really cool, awesome even. It is meant to strengthen marriages, relationships. I think it does that! Ya’ll out there should watch it. I reckon I would like a copy of the 40-day love dare book and try it out, except I have kinda ruined it by posting that I might try it out. I have been excited about checking out Fasnacht for months now. 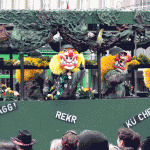 So inspite of still being a wee bit sick, I took the boys on the train into Basel for the Basler Fasnacht Wednesday parade. 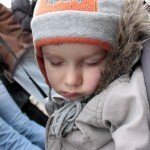 We missed out on the local Aarau Fasnacht. 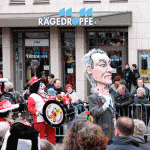 If we had all been well, we would have loved to go to the opening 4am parade on Monday in Basel too. 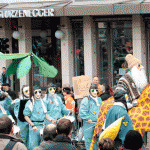 Fasnacht is a pre-lenten festival held in parts of southern Germany, Switzerland and Austria. I can`t figure out much more than that about the history of it. 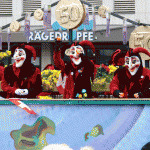 I have to say that Fasnacht is one of the strangest carnivals ever. Does anyone actually know where it came from and why people wear crazy and quite frankly, scary costumes?! All the websites I check out don’t seem to really know. They do say you have to be a Basler to understand the humour of it. And their dialect too. I guess I didn`t really understand. Like, what was with the Santa Clause look-a-like riding a giraffe with a bunch of aviator head, tropical musicians? And why do they throw fruit? An elderly man standing next to me wasn’t so lucky, I guess his reflexes weren’t so quick and got and orange thrown at his nose. There were oranges and bananas being thrown in every direction. Along with garlic and leeks?! I know, random! Of course, HUGE amounts of confetti everywhere. It was one of the weirdest events I have even attended, but I am still very impressed. It was pretty cool to be part of this festival, even if just for an afternoon, and even though I didn`t get it. The costumes were incredible and must have taken lots of work and imagination. And the music was cool. Loved all the piccolo playing gnomes and colourful drummers. I love that people get into character and have no shame in wearing any costume and acting the part. Lots of the crowd were dressed up too, even wee one year olds. Would love to the see the New Zealand crowd actually get dressed up for real. I have been to heaps of ‘costume parties’ where no one has bothered to get dressed up. SAD! 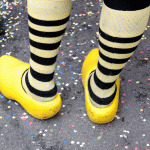 Us New Zealanders have a lot to learn when it comes to tradition, costumes and throwing party parades! Like my new hair-do? No, just joking! So, Is it just me or has anyone else noticed the seemingly excessive number of hairdressing salons here in Switzerland? They are on every corner. Actually, from our apartment walking into Aarau I pass SEVEN hairdressers (in about 400m). I went to get my haircut a couple of weeks ago and the hairdresser tells me there are 50 hairdressers in Aarau alone. That is catering for a population of 16,000. In Manukau, New Zealand, for a population of 360,000, there are 140 hairdressers. So that makes it about 8 times more hairdressers per capita here than in Manukau. Wow! But then, have you seen the haircuts people have here? They are perfect and everyone looks stylish and good. And you pay too, about $80 ($120 NZD) for a women’s haircut in Aarau which seems to be about the average. I was paying about $40NZD (about $25CHF) for a haircut. But the service is perfect. And they take more than 10 minutes to cut hair too! On arrival, they open the door for you, take your coat (which they do give back! ), ask if you would like tea, coffee, juice, water (with or without bubbles!) I was even offered fancy Christmas herbal tea and biscuits. They take you to a chair and talk for 5 minutes about what you would like to have done and give advice / tips. After washing you hair and massaging, they cut it. And boy, they cut so well. Like every hair is in place and with such attention to detail. Anyway, perhaps enough babbling. I have had my hair cut twice since being in Switzerland by different salons and both were incredible and professional and friendly. I love my Swiss haircuts. Who is the King? If I asked Toby that, his answer would be ‘God’, and he would be right! But I am talking about something a bit different. 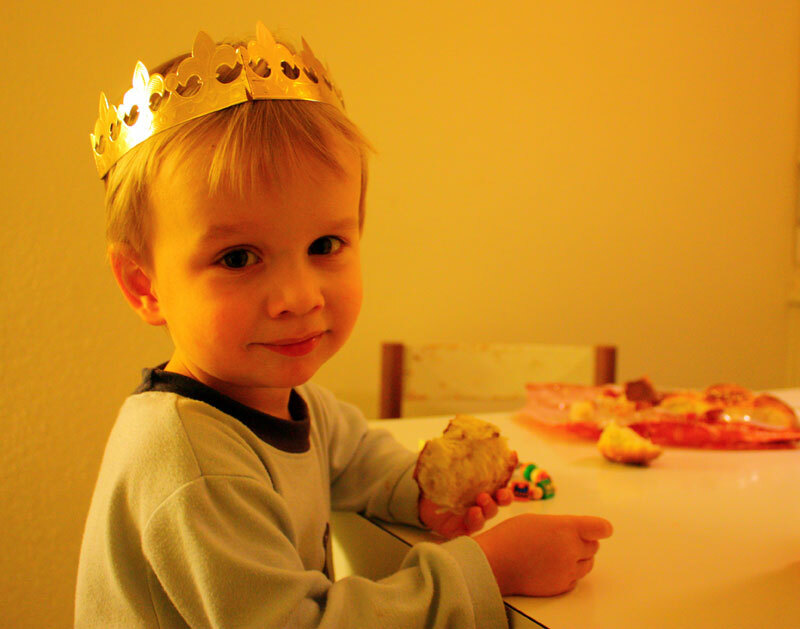 Today is the 6th January and the Swiss celebrate the ‘Heilige Drei Könige’ (or ‘Epiphany’ in English speaking countries) and it is commemorating the Magi or Wise Men visiting Jesus. 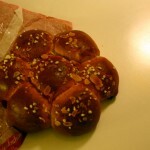 In Switzerland, it is tradition to buy / make a Dreikönigskuchen (Three King’s cake). 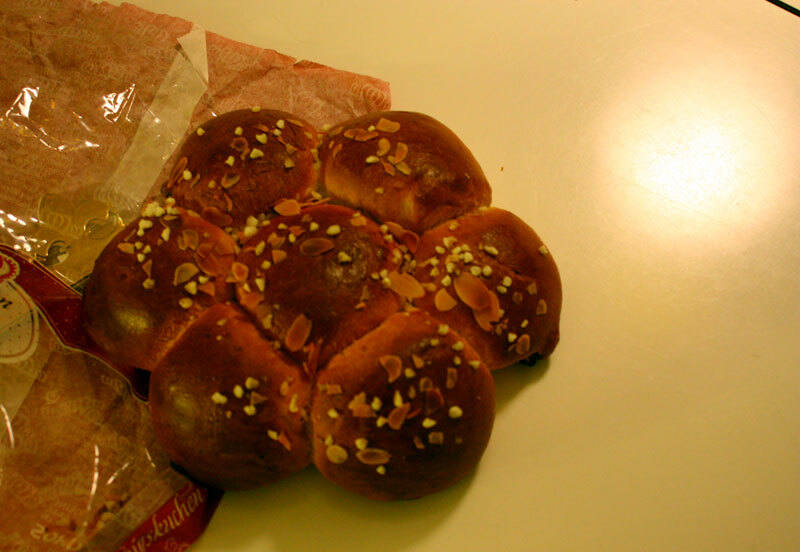 One of the buns is baked with a plastic king, each family member takes a bun and the one who finds the wee king in their bread is named King of the family for the day. 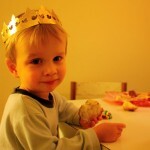 Guess who is our King!? 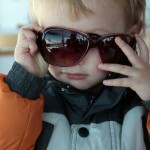 The youngest member of the family – Noah! 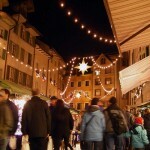 With or without snow, a Swiss Christmas is beautiful and magical. 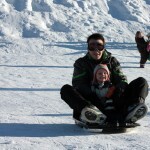 Nope, it wasn’t a white Christmas (unless you were above 1000m). But thats ok, it was an enjoyable one, nonetheless! The one thing that stood out to me, was the cozyness of it. Cold outside, warm inside and lots of candles. Real candles on the Christmas tree. I love candles and didn’t really think about but in NZ it doesn’t get dark till 9 or 10 at Christmas so candles are a bit useless! It was great to be able to celebrate on Heiligabend (Christmas Eve) with my Grosi and then on Christmas Day with my Grossmueti & Grossvati. 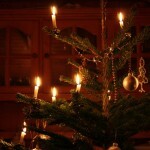 And the smells – so good – like a pine needle that gets caught on a candle and lets off a beautiful pine scented smoke. Drinking wine, eating beautiful food and Christmas guetzli. Mmmmh. The boys were spoilt with lots of exciting presents. Today is a amazingly beautiful day, blue sky and I can see that sun again. Its been awhile! 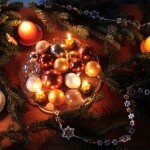 Hope you all had a wonderful Christmas, warm or cold and wishing you all a great 2009. God bless. 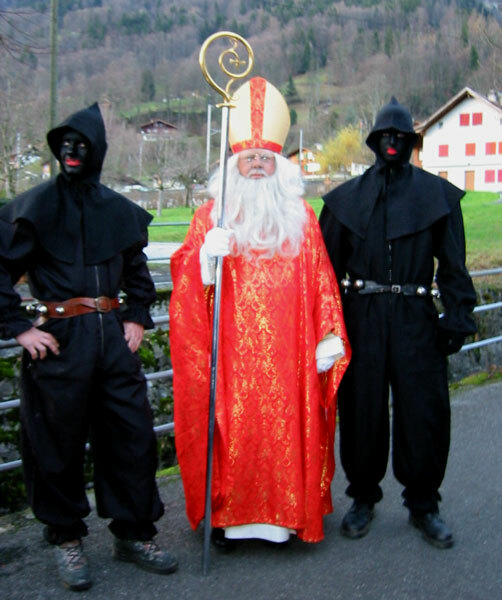 In Switzerland, Samichlaus / St Nikolaus / Santa Claus comes to visit on the 6th December. He lives in the Black Forest (not the north pole) and ventures out with his scary looked black (usually painted black with coal) hooded helper ‘Schmutzli’ to visit children. No reindeer or elves, just his grim reaper side kick and a donkey. 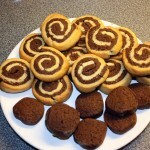 Samichlaus hands out treats to the kids – typically mandarins, peanuts, chocolate and gingerbread (lebkuchen). 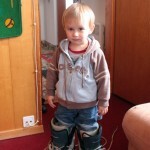 But there is a catch, the child have to be good all year. Parents let Samiclaus know in advance of their children’s behaviour and give him a list of the good and bad things the kids have done in the past year. If they are mostly bad then Schmutzli scoops them into his sack and carries them away. I actually don’t think that is allowed, but children are warned that if they are bad, that might happen. 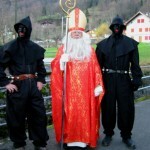 Not sure if I like this Samichlaus much – not much forgive and forget going on there! I think I would have been a permanent resident of the Black Forest had I got a visit from him as a kid! 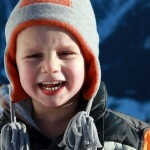 But as a parent, maybe it would be a good all year round bribery tool! 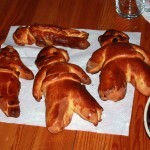 One traditional thing you do on Samiclaus day is eat Grittibänz. 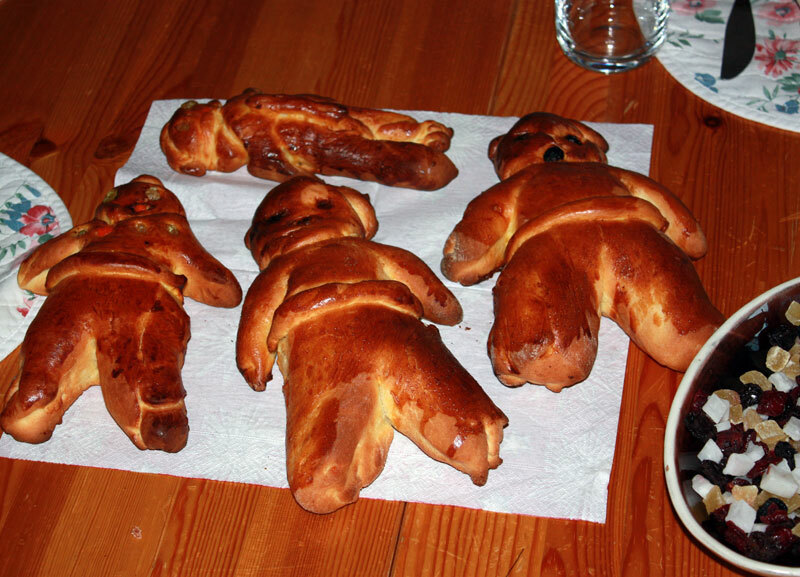 Bread shaped like little clown men. I don’t know why. But they are yum. Toby loved eating the raisin eyes off then bit off its head. My grossmueti made us some beautiful Grittibänz and we enjoyed mandarins, peanuts and other good traditional Samichlaus day food. 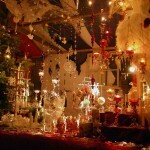 The next Christmas market that was on my list was Bremgarten. 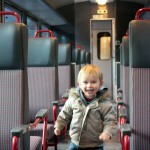 Actually, I wanted to go to Bremgarten once anyway and show Daniel that gorgeous little town. It is so beautiful and only a half hour drive from Aarau. The cobbled streets and traditional houses from the 1200’s along with a beautiful church make for an incredible setting, especially for a Christmas market. 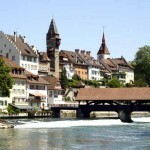 It is on the river Reuss and has a cute old wooden bridge too. We went to the markets in the pouring rain and freezing cold and were surprised to see that the weather didn’t put people off – it was busy! 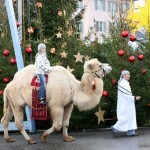 It did clear though, in time for Samichlaus and the camel (!) riding. We ate lots of Öpfelchüechli (check out more about these on Jessica’s blog) and drank lots of Gluhwein (also on Jessica’s blog – thanks for doing all the hard work for me, Jessica!). If I search deep within and be really truthful I would have to admit that my motive for going to these markets is all about my stomach – Öpfelchüechli and Glühwein. And the atmosphere and the beautiful villages and scenery of course. 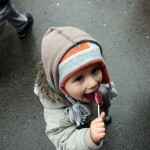 The boy enjoy them too, with all the carousels and chocolate covered bananas, magenbrot and lollipops! 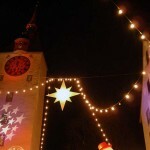 The night photos are taken from the official Bremgarten Christmas market website. I think I have said this before… but I love how creative the Swiss are. I love that they decorate their houses to fit each season. 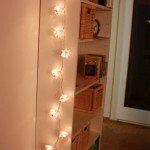 The array of Christmas decorations available are amazing. Their handicraft markets are pretty cool too, and people actually buy the stuff! It is quality! So I went a bit crazy and found a Bastel shop (handicraft shop) which had stuff I didn’t know you could buy. I could have spent hours there, except that I had a wee 2 year old with me who wanted to touch everything and see if there was anything edible in the shop. I bought some supplies and made some things. 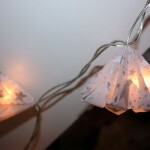 Cool lanterns to hang on a set of fairy lights (thanks Cornelia for teaching me!) 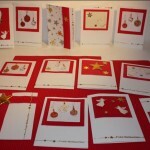 and I’ve made all my own Christmas cards this year. The boys and I even made some more biscuits and Noah and Toby have been busy making soaps, snowflakes and various paintings and drawings. Ok, I know, I am boasting but it just feels so great to unleash that creative spirit in me. 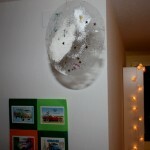 I used to do so much creative stuff but that must have been 15 years ago! Aaah, I love this country!